The life of Amedeo Modigliani, (12 July 1884 – 24 January 1920) is as fascinating and dramatic as his works. Although the Jewish artist, who was born in Livorno, Italy in 1884, had good contacts with Pablo Picasso, Constantin Brancusi and other members of the Avant-Garde, he felt more affinity with the creative work of Cézanne amid the Italian Renaissance. His friendship with Brancusi also fueled his devotion to sculpture. But, after 1915, Modigliani devoted himself entirely to painting, producing some of his best portraits. His interest in African masks and sculpture is evident in the treatment of the sitter’s faces: flat and masklike, with almond eyes, twisted noses, pursed mouths and elongated necks. Despite their extreme economy of composition and neutral backgrounds, his portraits convey a sharp sense of the sitter's personality. He went on to develop a sophisticated, graceful style of decorative arabesques, simplified forms and luxuriant nudes. However, the artist was not able to live to see the true dimension of his success. His health deteriorated rapidly, and his alcohol-induced blackouts became more frequent. In the winter of 1920, after not hearing from him for several days, Modigliani was found in his apartment dying of the then-incurable, tubercular meningitis, exacerbated by poverty, overwork and an excessive use of alcohol and narcotics. There was an enormous funeral for him, attended by many from the artistic community. His fiancé, Jeanne Hébuterne was taken to her parents' home, where, inconsolable, she threw herself out of a fifth-floor window two days after Modigliani's death, killing herself and his unborn child. Modigliani was interred in Père Lachaise Cemetery. Hébuterne was buried at the Cimetière de Bagneux near Paris. 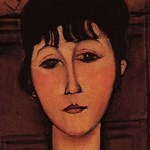 It was not until 1930 that her embittered family allowed her body to be moved to rest beside Modigliani. A single tombstone honors them both. His epitaph reads: "Struck down by Death at the moment of glory." Hers reads: "Devoted companion to the extreme sacrifice." Modigliani died penniless and destitute—managing only one solo exhibition in his life and giving his work away in exchange for meals. Since his death his reputation has soared, with over a dozen novels, plays and feature films devoted to his life.